The Lindy solid wood Platform bed is the essence of simplicity. It was formerly called the Pecos. With it's clean lines and super strong construction, it will fit into any home decor or style and provide many years of service. And yes, it's actually made in America. We can do it! 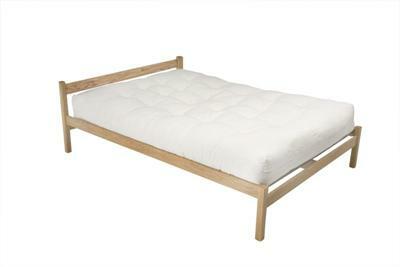 This Platform Bed Frame is Made in America, out of 100% Sustainable hardwood. There are dozens of ways that you can customize this bed, and almost any custom length, width or height can be ordered. The following are some of the available options. 1. This Bed can be made out of premium American grown Appalachian Red Oak, or Hard White Maple. 2. We recommend upgrading to 100% solid Poplar Hardwood Slats. The gap between the slats is about 3". 3. You can upgrade to double the Poplar slats, which makes the gap about 1/4" between each slat. 4. Platform Height is normally 12", however there are options to raise or lower the height of the bed. 5. Platform Bed Options change the headboard gap for various mattress, futon, or box spring heights. 6. Footboards can be made taller on most models. 7. You can choose Unfinished, or Light Linseed Oil with Oak or Maple Wood, or Oak with a Darker Oil. 8. Orders leave the factory in about 2 1/2 weeks, but you can pay extra to have it shipped in about 1 week. Frame Width 43" 43" 58" 58" 64" 82" 76"
Frame Length 79" 85" 79" 85" 84" 84" 89"
Mattress Width 39" 39" 54" 54" 60" 76" 72"
Mattress Length 75" 80" 75" 80" 80" 80" 85"
If you have any questions about this, or any of our products, please don't hesitate to give us a call.